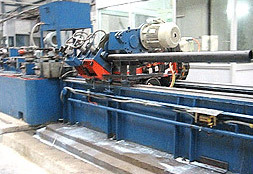 Burr Free Cutting Car is used to provide a perfect cut at the end of the pipe without any burr. Our Burr Free Cutting Car has Microprocessor based Servo Control System consisting of three phase- AC Controller with AC Servo and brake holding. Burr Free Cutting Car has a Pneumatic Cylinder with Magnetic Censorsâ�� non-return valve, automatic Brass Vice, MMI for Operator Control. Consisting of Connecting Cable between Servo Motor & Controller Programming Software tool â��Easy Riderâ�� with connecting lead, Burr Free Cutting Car also has a Drake chain for cables.